I wrestled with myself because I have issues with money and my own self worth. I have loved Christopher Durang’s plays my entire adult life. Just reading them makes me laugh out loud. He writes in so much of the action that I am able to visualize his plays without needing to see them live…. Still, I’ve seen what I could. “Sister Mary Ignatious..,” in the Village (1979). My maiden Durang voyage. That solidified my fear of religion. “Beyond Therapy” with John Lithgow (1982) had a lot of laughs and pop culture references. It cemented my affection for the playwright. I even laughed myself silly during a high school production of “‘Dentity Crisis” prompting me to bring my daughter to a revival of “The Marriage of Bette and Boo.” She too had become a Durang-aphile. However, I neglected to prepare her for its ending, and there were some repercussions of Durangian absurdist proportions heaped upon me that night. 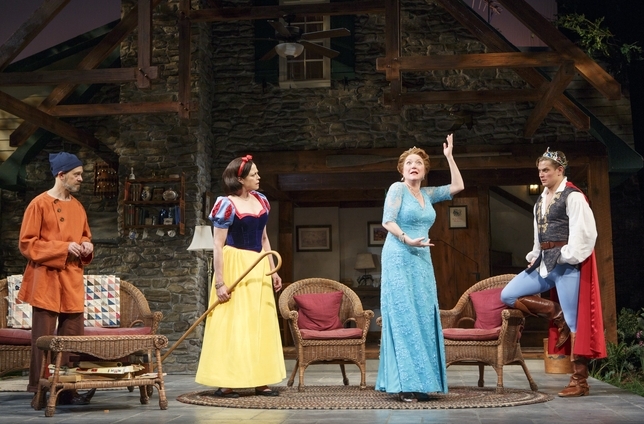 “Vanya and Sonia and Masha and Spike” may be the best play Christopher Durang has ever written. 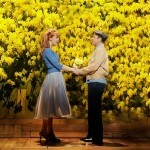 An opinion shared with many as it won the Tony award for Best Play. The fact that I almost denied myself this pleasure due to my own self loathing is reprehensible! His characters are odd of course, innately eccentric, but completely believable. This is due to the marriage of a very linear, hysterical and compelling story and a company of solid actors thoughtfully directed. It is truly an ensemble piece with the supporting players all having their moment in the sun. Creed Garnick and Leisel Allen Yeager succeed as stud and ingénue respectively, but Shalita Grant as Cassandra, the psychic harbinger of doom gave us every ounce of energy humanly possible. We will certainly be seeing more of her on the Great White Way. 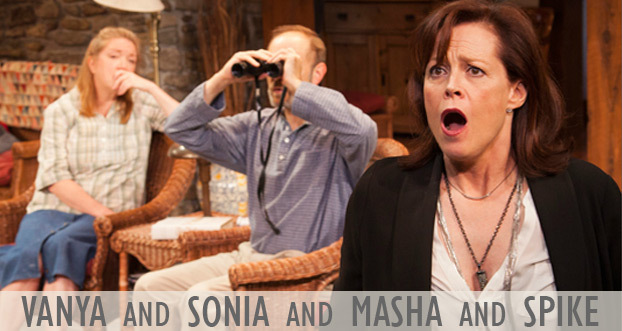 I wish I had seen Sigourney Weaver as Masha only because she and Durang go way back (back to college in fact). I am sure the deep and personal affection between the two has been helpful in creating these bizarre but ultimately believable characters. Julie White, who took over for Sigourney Weaver in July (the play was extended and Weaver had a film commitment) was extraordinary as the self involved sister who descends on the Cheklovian family with her rather dim boy toy, but it was Kristine Neilson who stole the show. Her portrayal of the bi polar (but mostly depressed) adopted sister who spent many years caring for her ailing parents and longing for her gay professorial brother (aptly played by David Hyde Pierce) evoked both pathos and belly laughs. Her feelings of invisibility and self-deprecation struck a chord with yours truly, but her “Maggie Smith” transformation was sheer brilliance. David Hyde Pierce ambles through the play as one would expect him to; with dry humor, sardonic remarks, unsubtle lust for the toy boy and rampant superiority. But there is a tirade in the second act that is a magic combination of great writing and flawless execution that brought the whole audience together in thunderous applause. Those five minutes alone would have been worth the price of admission. Theater in New York has become a luxury for the rich or lucky (some shows have lotteries) or the young and patient who have the time to wait on long lines for possible discount or rush tickets. Sadly, that excludes a demographic most likely to be enthusiastic, vocal and perhaps repeat customers. Those of …ahem… a certain age and economic means who are in need of a good laugh perhaps more than the young or privileged. That being said, “Vanya and Sonia and Masha and Spike” was worth every nickel. If it is true that “laughter is the best medicine,” I left the theater in perfect health. Unfortunately, this production closed on August 25th 2013, but if it pops up again anywhere, do anything you can to catch it. If I was deserving of this, you are too!